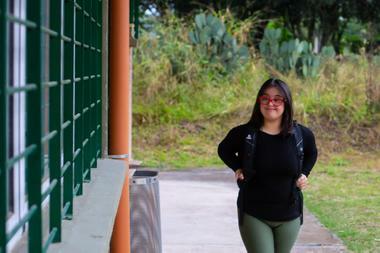 Although today Eva Godoy is pursuing a career in Engineering in Natural Resources and the Environment, the road she had to travel to fulfill her dream had some obstacles. 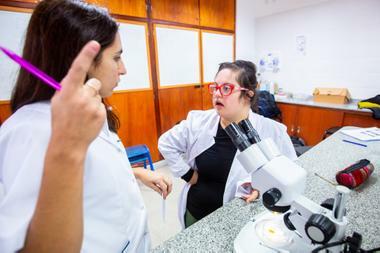 “At school I always felt comfortable and safe, but in the faculty they treated me differently just for having a more specific and special intellect,” says the 20-year-old girl with Down syndrome. After finishing high school, Eva, who lives in Salta with her parents and one of her brothers, had already decided that she was going to study a university career: “I wanted to be like my mom, I admire her a lot”. So it was that, just like his mother, he decided to start studying engineering at the National University of Salta. “Our daughter's income was a shock to teachers,” says her mother, Adriana. Although Eva placed on her registration form that she had Down syndrome and needed a pedagogical companion, as well as adaptations in the forms of teaching and evaluation, most of the teachers did not agree to carry them out and the authorities “left it in the hands of each”. That they needed a resolution from the faculty, that they had no way of making sure if the student really understood the contents, that they did not know how to adapt the methodologies and ways to evaluate. These were some of the excuses that the student and her parents received from various teachers. Even, a chair, after the parents of Eva refused to be evaluated because the teacher did not want to adapt the exam, disapproved without any evaluation and sent an email dismissing his teaching assistant. “It is the people who exercise the discriminatory act actively, because not doing something for another is also discrimination,” says Juan Godoy, Eva's father. Inadi, who proposed a mediation with the faculty and the university. “I think that for teachers it can be difficult to face a different situation, but putting a little effort can be resolved and achieve the inclusion of a person,” says Álvaro Ulloa, delegate of Inadi in Salta. Although the complaint took by surprise the authorities of the university, who declared not to have been aware of certain discriminatory situations, they agreed to make decisive changes. 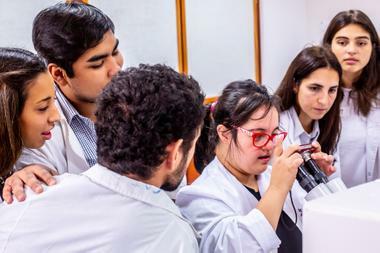 “This has been a historical fact because it placed us in front of the importance of knowing in depth the law and of rethinking all our practices to provide an inclusive education,” says Rubén Correa, general secretary of the National University of Salta. This semester, Eva is studying only one subject because she has not been able to take exams of several correlatives. But within the changes that drove the resolution, the university included a new protocol that adapts curricula and subject programs and teaching and assessment methods (such as splitting the exam into parts, for example), and made the commitment to provide training courses and training to teachers and administrative staff. In addition, the institution agreed to take over the hiring of the pedagogical companion. Despite the difficulties, his parents believe that this will help the university to become aware of people with disabilities and make this situation visible inside and outside the institution. “This is a paradigm shift and a process, and that's why we always appeal to dialogue as the way to approach the difficulties,” Juan emphasizes. According to Adriana, who is also a teacher, there is a lot of resistance in the teachers to strive for the inclusion of people with disabilities, especially intellectual. “There is a lot of ignorance, but inclusion is an exercise that we should all practice,” highlights Eva's mother. 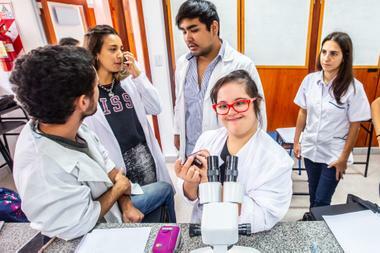 “If as a teacher you notice that the student with disabilities takes longer to copy from the blackboard, you can give them a photocopy of the content,” says Adriana, when she thinks of the different ways of adapting teaching methods for all. “An adaptation is to think about how to facilitate the student's learning, it's as simple as that,” he adds. Of the 18,000 students who enter the university, almost 50% drop out in the first semester, says Juan, who not only believes that there is still a lot to do for inclusion, but in the education system in general, which he sees as “expeller” ” “When you enter the university, you suffer because the student is not visible as such, it is just a number,” he says. This is a starting point towards change: “It does not have to be seen as a particular case, but as the beginning of the inclusion of people with disabilities in the university system”, highlights Eva's father. Today the young woman is in her second year of career and is assistant professor of her favorite subject, Zoology. “I think they appealed to her that she can not, that she was going to get tired, that she was going to have such a great difficulty that she was not going to be able to do it, but she showed them that they were wrong,” Juan concludes. According to Inadi records, the main reason for reporting discrimination in the last five years was disability. In 2018, of the 336 received in the educational field, 83 were for the same reason. You can call 24 hours a day at 0800-999-2345.